After a calamity, when the society we know has fallen, what community springs up from the ashes may be something familiar and will hopefully learn from past mistakes. But it will also have its own unique struggles to face. How do you feed a growing population outpacing available resources? What can be salvaged from technology from years gone by? How do you keep order within the community? 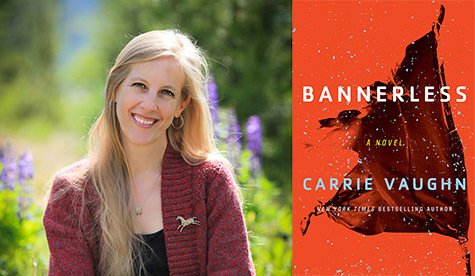 Carrie Vaughn’s latest novel Bannerless, delves into those questions years after one such calamity. Society is surviving and in some cases growing. Some technology has survived, but society is being rebuilt on the ashes of the previous. With resources at a premium, birth control is mandatory and households must be able to prove that they can support a child by earning a banner. In the town of Haven, Enid the Investigator helps to keep the peace within the community. Even though she’s still a greenhorn, she becomes involved in the investigation of a suspicious death that is so much more than it seems. Carrie Vaughn is the bestselling author of the Kitty Norville novel series, featuring a werewolf radio host. She is also the author of numerous other books including, the young adult novels Voices of Dragons and Steel, and the fantasy novel Discord’s Apple. Her short fiction has appeared everywhere from Lightspeed to Tor.com and right here in Clarkesworld. Her latest novel is Bannerless, out this July from John Joseph Adams books. What was the genesis of your idea for Bannerless? I’ve been writing short stories set in this world for a number of years now. (The first, “Amaryllis,” was a finalist for the Hugo Award for Best Short Story in 2011. Another, “Astrophilia,” appeared in Clarkesworld.) A couple of years ago, I wrote the short story version of “Bannerless” and the main character, Enid, jumped off the page. She was so vivid and interesting, I wanted to write more, and so I came up with the idea of writing a murder mystery set in this world I’d been building up, with her as the detective. What inspired you to delve into the post-apocalypse sub-genre? I started with the idea that an apocalypse wouldn’t necessarily wipe a society’s slate clean (as we see in the Mad Max style post-apocalyptic world). People would remember, they’d save what skills and technology they could. I wanted to show a world that had learned from the mistakes of the previous society, and tried to build a community using those lessons. It’s a little bit idealistic. Was there a particular post-apocalyptic novel that influenced you? Walter M. Miller’s, A Canticle for Leibowitz, absolutely. That novel is all about what gets saved, and how it gets saved, and whether or not society is doomed to repeat its mistakes. It’s not post-apocalyptic, but I was also influenced by Ursula K. Le Guin’s, The Dispossessed, as a model for how to write about a community with a much different political structure than our own. The juxtaposition of new and old tech was an interesting choice. There are solar cars paired with horse and carts. What made you include both new and old tech? I start with the premise that during a societal collapse, people will try to save what they can, what they feel is most important. Solar-powered electric cars—solar powered anything—is something that might get saved, but they’ll be rare. Horses might well exist alongside them as a more common, viable form of transportation in a mostly post-technological world. Many regions of the country have access to both right now, and a society that is short on resources is going to use everything. The idea of “earning a banner” is an interesting way for a society to regulate its population. Does this have any parallels to real world child policies put forth by various countries? A little bit, in that I know such policies exist, but I came at the idea more from a perspective of resource management. This is a society that wants to ensure that every child born is going to be adequately taken care of. So, it’s not necessarily population control so much as a community asking, “How much do we have? How much can we produce without overburdening our resources? How many people can we support with those resources?” and then making calculations accordingly. I also wanted to see what would happen if I built a world where it isn’t automatically assumed that people will have kids, the way it is in my own culture, where people tend to get suspicious if you don’t have kids. I wanted to see a world where instead of people asking, “Why don’t you want kids?” the question becomes, “Why do you want kids? Why should you have kids?” I wanted to flip that whole set of expectations. When developing characters, do you pull them whole from your own life, your imagination, or is it more of a piecemeal mix-and-match? It’s organic. They grow out of the story, ideally, and the story and character influence each other, back and forth. I’m constantly asking, “What kind of person would get into this situation?” and “Who do I need this person to be in order to respond to the story this way?” A chatty person, a quiet person, a courageous one, a careful one—they’d all respond to situations differently. So, I try to build them both together. Enid is probably my favorite character in the novel. Did you have a favorite character while writing? Enid of course. The novel wouldn’t exist without her. She’s my detective, and it’s her curiosity and sense of justice on which everything hangs. I also love her drive and curiosity. Murder mysteries typically rely on very tight plotting. What did your writing process look like for this novel? Was it any different than some of your previous books? Mystery plotting is really tough, maybe one of the biggest writing challenges I’ve confronted. The goal is to complete the book and have it look like you planned every step of it in great detail. My own writing style is much more chaotic, and I had to adapt that chaotic style to writing a mystery. Generally, I do two or three complete drafts. The first is to get down all the ideas—figure out even basic details like who the villains are, and so on. The second is to change everything once I see what the story is actually about and how it all needs to hang together. The third is refining, making all the connections that make it look well planned and tightly plotted. I’ve heard you listen to music when you write. What artists have you been listening to lately? Do you find the music can influence the tone or flow of your writing? I do listen to music, all kinds. Weirdly, lately while I write I’ve been listening to various themed tracks on the Ambient Mixer website—mostly Elvish settings from Lord of the Rings. It’s meditative. For Bannerless, my go-to album was Dead Can Dance’s Aion. Do you plan on writing more stories in the Bannerless world? I’m working on a second novel right now, another murder mystery featuring Enid as the main character. I also have a prequel short story that should appear on Tor.com sometime in the next year. Too many to name! I always have a bunch of short stories on deck. I’m also a contributor to George R.R. Martin’s, Wild Cards series, and I’m working on more stories from that. Any other projects are in early stages. If you were a supernatural creature, what would you be and what job would you have? A werewolf radio host is a perfectly acceptable answer. Heh, I don’t have the right personality to be a radio host! I’m not gregarious enough. But I think a vampire historian would be just about perfect.